Sicily, as I will reiterate throughout my posts, is a place of extraordinary contrasts. Few contrasts stand out more than that between splendor and squalor in the very heart of Sicily’s greatest cities. 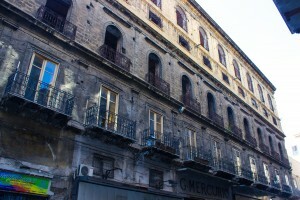 Amidst the great buildings, high-end stores, and modern pulse of Palermo are the remains of neglected buildings still black from the allied bombing in World War II. It is nearly inconceivable that such spectacular buildings remain unaddressed over 70 years later, yet at almost every turn in the city you were confronted with this stark reality.